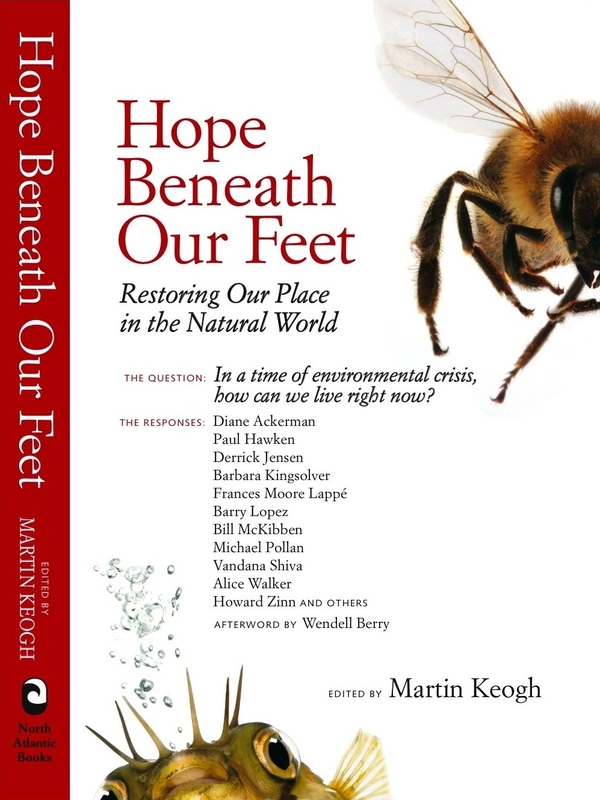 Hope Beneath Our Feet, Restoring Our Place in the Natural World is a new anthology of essays by well-known and lesser known authors who responded to this question: In the midst of environmental crisis, how can we live NOW? I am unabashedly promoting the book because I am one of the lesser known authors. To be published along with the writers and thinkers to whom I have turned for inspiration over the last twenty years, is a huge honor for me. Some of these mentors are: Frances Moore Lappé, Bill McKibben, Wendell Berry, Barry Lopez and Howard Zinn. The book’s genesis is the work of Martin Keogh, its Editor. In the forward, Martin describes how his children expressed a sense of hopelessness about the future as they considered climate change or nuclear war—challenges that dwarf our sense of being able to make a difference. He wondered how human beings can keep hope and live well in very uncertain times. In 2006 Martin issued a call to writers to submit an essay answering the question above. The book is published by North Atlantic Press and is now in its third printing – barely a month after its release. I just cannot wait to read this and also to attend your workshop. What is the date again? Thanks. The workshop is October 9, Saturday at Barnes and Noble. Not sure of the time yet but there are a lot of events on that day with teachers and parents and children invite to view books that encourage youth and children to have hope and to take action to build a world that is safe and beautiful. I just found you through DJ’s blog, I look forward to reading the essays. Thank you. Glad to know you are getting something from the site! Thanks for letting me know. What kinds of information or articles do you like the most? Most of the blogs online are pretty much the same but i think you have a unique blog. Grats !